Discussion in 'Canon InkJet Printers' started by James Michael L. Acierto, Mar 30, 2017.
we were looking for a 2nd printer for office work and managed to snag a relatively new MG5620 with a page count on the nozzle check of 50-100 pages for a cheap price.I was reading about the ink incompatibility issue on the newer printers and was wondering if an empty aftermarket cart would be better to start than trying to flush oem carts and risk clogging cartridges and nozzles? Would it be bad reliability wise to use inks meant for CLI-226 on these printers as we have some of those already and would like to have one stock of ink for both printers if possible. a somewhat unrelated question, is there a place that sells genuine new Print head that ships overseas? Our other printer is currently on its second refurbished print head (from faulty diagnosis and repair) that we lucked out on and works fine except it has a few random dead nozzles on the service print. You can also use CLI-226 inks in your cartridges, the colours maybe be a bit off but otherwise they will work in your printer. P.S. don’t forget a chip resetter for the OEM cartridges...! thank you, i was wondering if there are special procedures in flushing/preparing the oem carts to avoid the 'yellow jello' problem ? The best way to overcome Yellow Gello in the cart is to fill the cart with Window cleaner that contains small amounts of ammonia or add one drop of pure ammonia into your syringe mix, don’t start with water. Rinse a couple of time with the window cleaner and leave the cart to stand overnight still full, then rinse with normal water and finally fill the cart with pharmacist solution, 3 % propylene glycol, 20 % isopropyl alcohol (IPA), and distilled water up to 100 %. Thank you very much! will do that as soon as we could get a set of xl carts to run down. This thread has more info about the gelling problem and CLI-251 Y cartridges. As I understood from ink sellers, CLI-x26 inks should not be used on CLI-x51 based printers (question of viscosity ? ), except for PGI pigmented black ink. @Palatino, That may well be very so, but I use the same ink in several different cartridge types from BCI-6, CLI-8, CLI-521 and CLI-551 with no ill effect whatsoever, so where does that leave the ink sellers’ statement, it’s a matter of individual choice as to whether to purchase several types of the same dye ink ! I think this is very plausible. See this thread, and specially notice the posts by @Harvey . It seems that not only dye black can be affected by the fuzzy printing problem, but other dye colours can be affected as well. Perhaps the inkset for CLI-x51 is just to get a good color match to OEM ink. CLI-x26 will work good with a printer profile or some tweaking on the driver settings. Assuming that you dont have any ink just get the right ink for your printer. Best thing to do is to get high quality ink and a set of compatible cartridges with auto reset chips, and you dont have to deal with the yellow jello problem. This is the safest thing you can do and the cheapest way to use the printer. A set of XL carts plus the resetter will cost you an arm and a leg. XL carts are around U$80 and the resetter + U$32 for resetter whereas the refillable cartridges with auto reset chips will cost you around U$ 15 from China, and U$ 35 in North America. By using the ARC cartridges you can be bothered by them. What I would do is to get rid of this printer by selling it and providing a nozzle check print to let the buyer know the printhead is perfect. Get a previous Canon printer generation for an AIO you can get from a MP6x0 or a MGx120 series and you can forget about dealing with the tiny cartridges or the aftermarket ones. 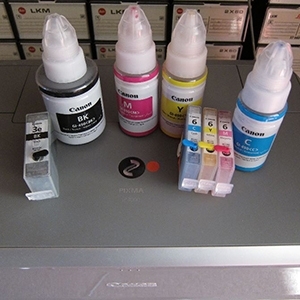 If you go the Epson way you can get any C, M, Y, LM, LC, K printer or AIO, (i.e R260 R280 R380 RX580 RX595 RX680) a set of refillable cartridges with ARC and then you get genuine ink for L800/L805 for around U$105 that has better longevity and fade resistance than any 3rd party Canon ink.